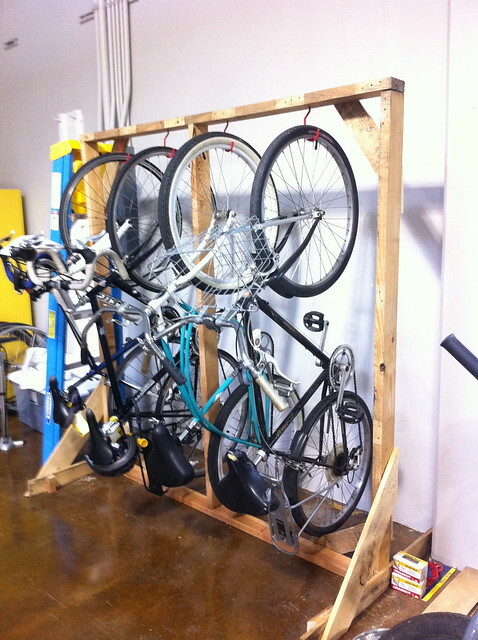 Hey Bike Commuters! Mir.I.Am here to share a super commuter profile with you for your after-turkey-afterglow enjoyment. 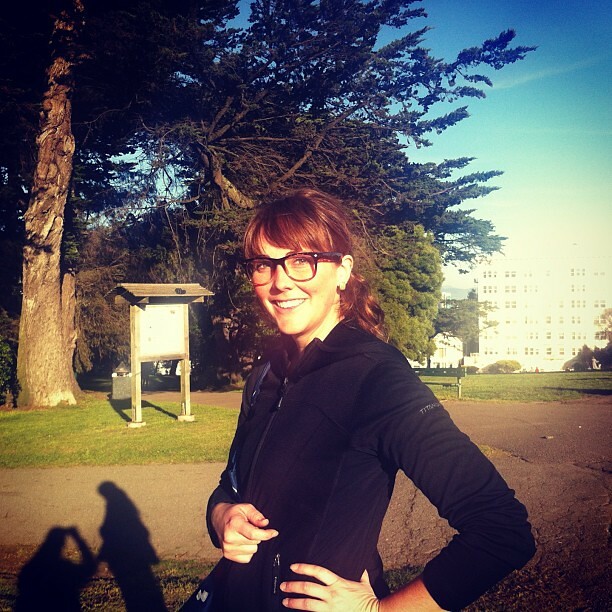 Say “hello” to Emily Shellabarger, a Bay Area train and bike commuting gal on the go. Although the Bike Commuter staff guys may argue that we indiscriminately love ALL commuter profiles, I’ve gotta say: I personally love when Cycle Ladies rep the commute because women on bikes are just plain hot! Alright, enough hype-man shiz, introducing… Miss Emily Shellabarger! Emily S., posing as a hipster! I’ve been bike commuting since I was a wee lass in the jump seat on the back of my dad’s 1983 silver Peugeot. 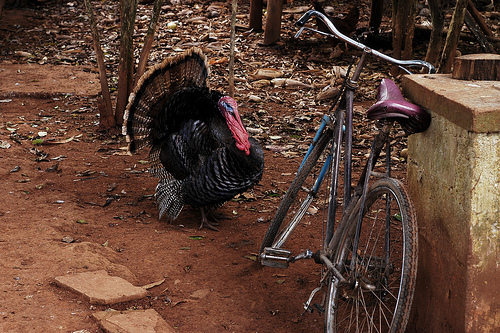 He pedaled me all over the streets of Eugene, Oregon–including the hilly commute to daycare. And, even though I have to do all the work these days, my love for biking and two-wheeled commuting endures. I’ve been regularly bike commuting for the last five years––two years in Sacramento and three years in San Francisco. 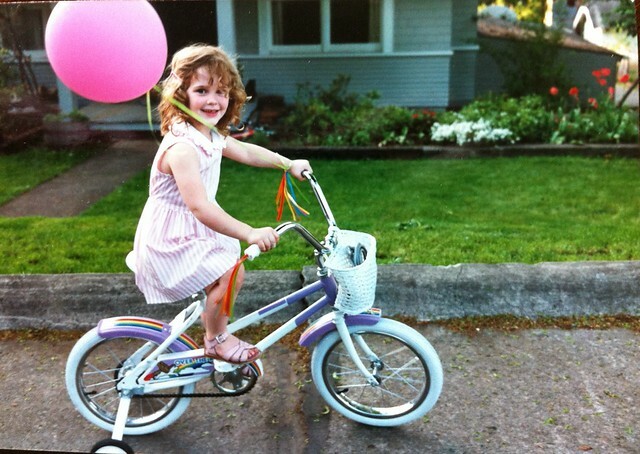 The wee lass in her bike commuter beginnings in Eugene, Oregon. 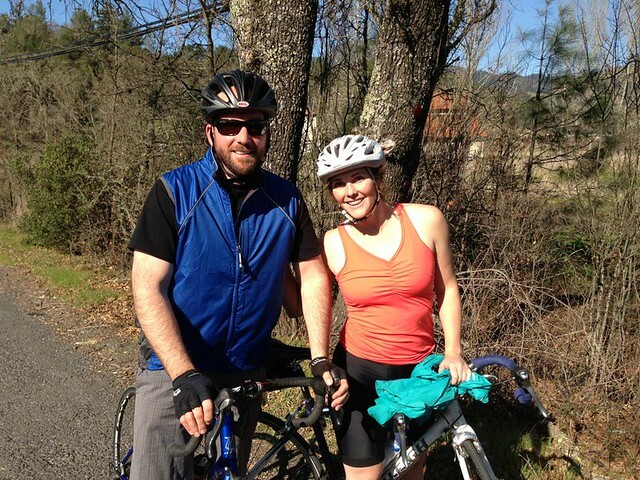 And the grown-up Emily, bike commuting in Norcal! 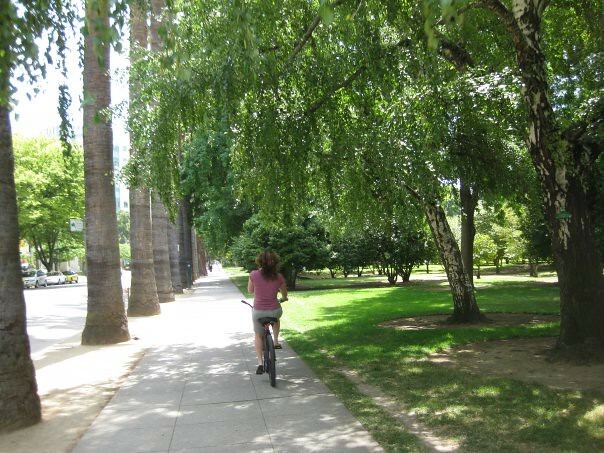 I started riding my bike to work in Sacramento because it was faster than driving. I lived less than two-miles from the office. And let me tell you, that was an easy bike commute. Downtown Sacramento has all of one hill––actually, calling it a “hill” is generous, I’ll go with “incline”––and it was not on my route. Just the right kind of ride for me and my creaky old Schwinn, Stallion. Boy, was I spoiled. After the company I work for relocated from the sunny flats of Sacramento to the Bay Area, I moved to San Francisco. My current commute includes 4-miles of biking + 30-miles of train riding + 2 more miles of biking. All told, it takes me just under an hour each way and beats the pants off of sitting in traffic on Highway 101. Beating the pants off sitting in craptastic traffic on Highway 101. Bike commuting in the Bay Area keeps me sane. Nothing puts me in a bad mood like sitting in stop-and-go traffic. 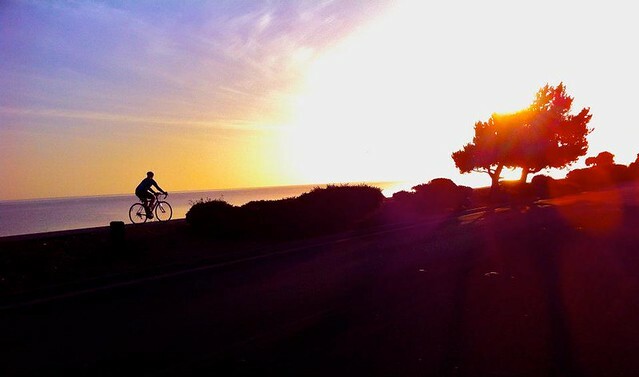 I’d much rather start the day whooshing down hills as the sun rises and pedaling my way to the train station. Plus, thanks to those San Francisco hills, I don’t have to invest in a gym membership and my money can be saved for more important things like happy hour. I manage consumer marketing and social media for a renewable fuel company in Redwood City, California. I live in San Francisco, so my bike commute spans the Peninsula of Silicon Valley. 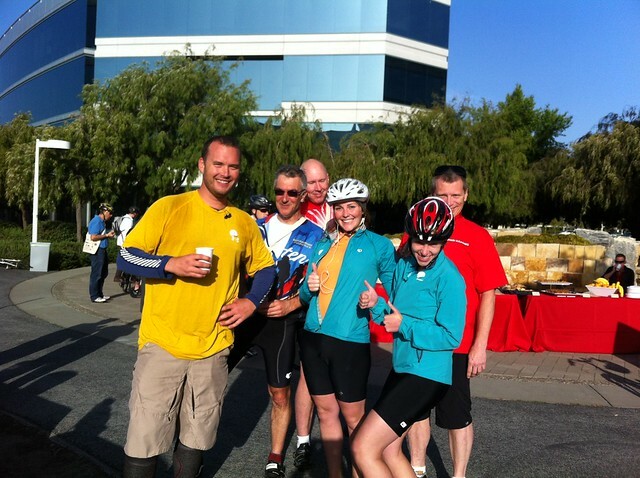 When feeling ambitious, I’ve been known to bike the entire 34-mile route, especially on Bike-to-Work Day (and not just because six-miles from my office, Oracle hosts the most amazing free breakfast buffet for cyclists). Whoa! Catch that sunset on the long way home from Redwood City. Emily on Roy the Road Bike. What kinds of bikes do you have? My trusty steed, Stallion, a big Schwinn cruiser from the 80’s. And my daily commuter, a 2007 Raleigh Cadent affectionately dubbed, Roy the Road Bike. Emily and “Stallion” cruising in Sacramento, CA. “Roy” the Raleigh roadie, hiding in the back of the rack at work. After moving to San Francisco I was anxious to dial in my bike route. I hunted online for the safest, flattest route and poured over my handy San Francisco Bike Routes map. I wrote out a turn-by-turn directions list. I had screenshots of the street route on my phone. I clicked through all the turns on Google street view, so I’d be fully prepared for visual queues. And I was still a bit nervous to venture out on the rowdy city streets, so I ended up bribing my roommate with coffee to accompany me on my first ride to the train station. Sometimes all you really need is a bike buddy to help get you out on the streets! When folks find out I bike/train commute from San Francisco to Redwood City, most people are impressed that I make the effort––or are slightly horrified. 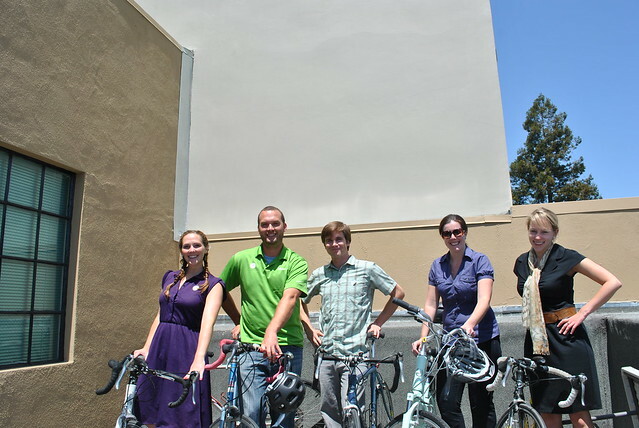 I’d love to be more active in bike advocacy, especially since there is such a strong cycling community in San Francisco. Currently, I’m most active with Commute.org, participating in their San Mateo County Bike-to-Work activities and clean commute challenges. 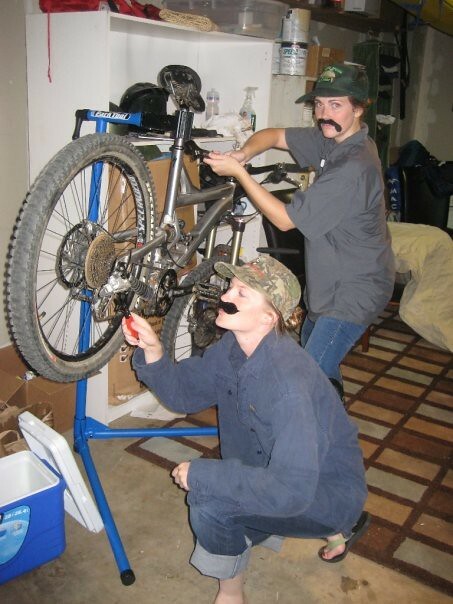 Or moonlighting as a bike mechanic – just in time for Movember Moustaches! Emily Shellabarger (oh man – such a good “two-name” name, who can resist holding back that Shellabarger?! 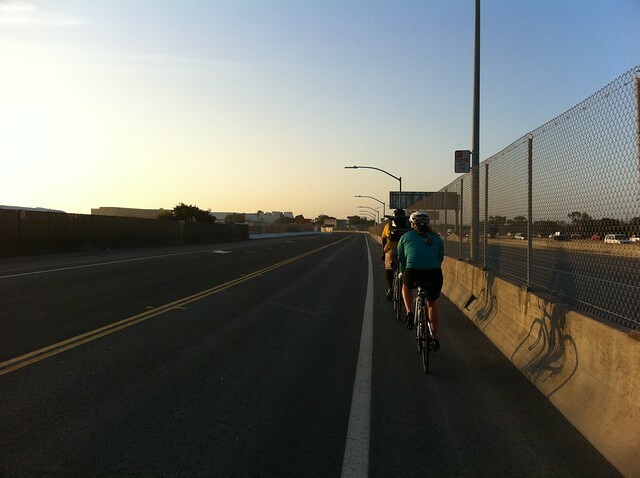 ), thanks for sharing your commuter profile and a little bit of west coast sunshine with Bike Commuters! I am personally jealous of your sweet commute with that killer sunset. Want to show us your ride and plaster your fantastic commute all over the internet? Then send an email and we’ll hook you up with a Commuter Profile questionnaire. Email Mir.I.Am for details. @Ben – I hope not, but you gotta admit: killer sunset! 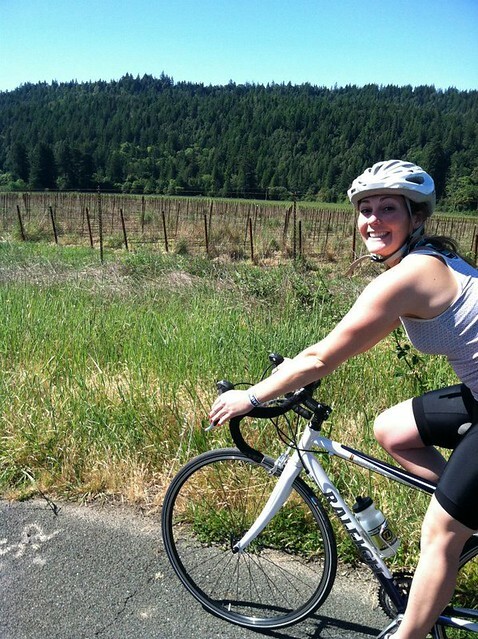 Now that I think about it, I think I met an Emily on a bike one Saturday morning last fall grinding up King’s Mountain Rd… I was on my way to Half Moon Bay and she was catching up with her friends.